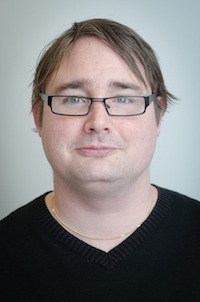 Per Ola Kristensson (June 27, 2013). License: CC-BY-SA. Hi! I am a University Reader (Associate Professor) in Interactive Systems Engineering in the Department of Engineering at the University of Cambridge and a Fellow of Trinity College, Cambridge. I lead the Intelligent Interactive Systems group, which belongs to the Engineering Design Centre. My research group is always open to new enthusiastic PhD students and post-doctoral scholars. A range of PhD projects are available. If you are interested then please do not hesitate to contact me. Support for post-doctoral scholars is available via a number of fellowship schemes. Again, please contact me for more information. February 9, 2018 Our work on analysing how people type by collecting 136 million keystrokes has received a Best Paper Honourable Mention at the 36th ACM Conference on Human Factors in Computing Systems (CHI 2018). June 14, 2017 I have been promoted to a personal University Readership (approximately tenured associate professor). June 13, 2017 I have been awarded an EPSRC grant (Design the Future 2 call). It will fund two Research Associates in my group for 36 months. October 4, 2016 I have been admitted as a Fellow of Trinity College, Cambridge. June 20, 2016 I have taken up a position as Associate Editor of ACM Transactions on Computer-Human Interaction (TOCHI). September 8, 2015 I have been awarded an EPSRC grant (User Interaction with ICT call). It will fund a Research Associate in my group for 3 years. It is a collaboration with the University of Dundee. August 21, 2015 I have received a Google Faculty Research Award. July 2, 2015 I have been awarded an EPSRC grant (Design the Future call). It will fund two Research Associates in my group for 18 months. March 3, 2015 Our paper "VelociTap: investigating fast mobile text entry using sentence-based decoding of touchscreen keyboard input" received a Best Paper Award at the 33rd ACM Conference on Human Factors in Computing Systems (CHI 2015). December 9, 2014 I am co-organising the CHI 2015 Workshop on Principles, Techniques and Perspectives on Optimization in HCI and the CHI 2015 Workshop on Text Entry on the Edge. If you are doing research in these areas then we want to hear about it! The workshops will be held on April 18 and 19, 2015 in Seoul, South Korea in conjunction with CHI 2015. See the workshop websites for the exact date of each workshop. 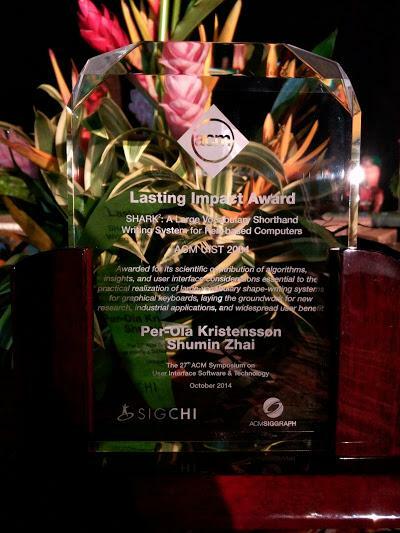 I have received the ACM User Interface Software and Technology (UIST) Lasting Impact Award for the paper SHARK2: a large vocabulary shorthand writing system for pen-based computers. It was published at UIST 2004. The citation reads: "Awarded for its scientific contribution of algorithms, insights, and user interface considerations essential to the practical realization of large-vocabulary shape-writing systems for graphical keyboards, laying the groundwork for new research, industrial applications, and widespread user benefit". October 6, 2014 Our new group website is up! It is still a bit thin on content at the moment. 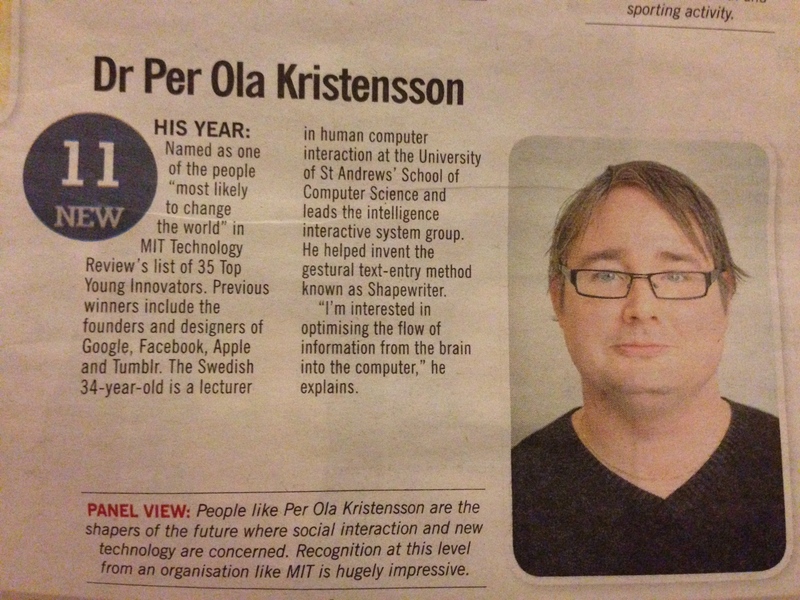 September 15, 2014 I have been appointed Honorary Reader in the School of Computer Science at the University of St Andrews. June 9, 2014 I will take up a University Lectureship in in the Department of Engineering at the University of Cambridge later this year. May 14, 2014 I am quoted about the future of text entry in the latest report from the Pew Research Internet Project. May 6, 2014 Our paper "AwToolkit: attention-aware user interface widgets" received a Best Paper Award at the 12th ACM International Working Conference on Advanced Visual Interfaces (AVI 2014). March 20, 2014 I have been awarded the Royal Society of Edinburgh Early Career Prize in Physical Sciences, the Sir Thomas Makdougall Brisbane Medal. See also here and here. January 20, 2014 There's an article in Financial Times that quotes me about the current state of touchscreen keyboards and the future of text entry. November 29, 2013 I am listed in The Courier Impact 100 at position 11. A scan of my profile in the newspaper is here. August 21, 2013 I have been named an Innovator Under 35 (TR35) by MIT Technology Review. My profile is here. See also here, here, here, here and here. Copyright © Per Ola Kristensson 2007-2018. All rights reserved.